The Munier-Optima Typewriter keyboard, once the ubiquitous overlay especially because of work in government offices, was a matter of interest with me back in the mid-1980s but I never caught on touch typing with it. 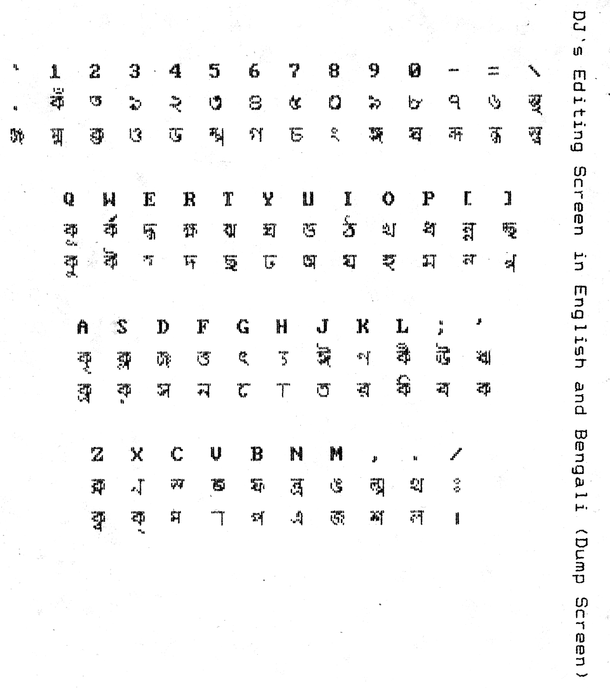 The next keyboard overlay that I used to key in a character or two was called DaungJan word processor, which offered a customised version to type text in Bengali with a changed codepage for the Devanagari script. The dump screen of the DJ's editing screen can be found |here| (png, 69kB). Much later, in the mid-1990s, I had to learn how to type Bengali the proper way -- no hunting and pecking. I learnt the Bijoy overlay in a day and started typing Bengali text on computer. Things later moved into Unicode and I switched to Unijoy, an overlay modelled on Bijoy, some time before the mid-2000s. On Linux I needed a Bengali keyboard overlay that could match the Unijoy layout. In xkben, the Bengali keyboard overlay that I use to write Bengali now on Slackware and Slax, has no dead key -- the full form of the vowels are mapped on to AltGr combinations and all other conjunct characters, explicitly visible or not, are keyed in with a virama between consonants. This keyboard is modelled on the Unijoy keyboard for Unicode Bengali (Click on the picture for a bigger file, png, 86kB). All we need to do is to copy the symbol descriptions below into a file called xkben and drop it onto /etc/X11/xkb/symbols --- on a Slackware, or Slax, machine. As this will act as an additional keyboard, you will need to add the following five lines to the xkb symbol file for Bangladesh, bd, or for India, in. The lines below need to be added to the xkb symbol file for the country we want the keyboard layout to be associated with. Into the symbols directory, the command xkbcomp -lhlpR '*' -o ../symbols.dir will do the rest of the processing. In the windowing environment, the keyboard could be selected by issuing the command kcontrol for the KDE Control Menu.